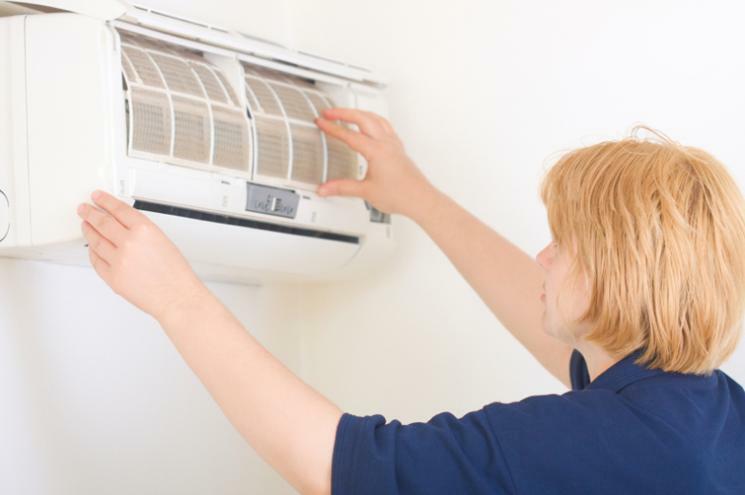 It is typical for a central air conditioning unit to experience several problems. However, you can minimize these with regular unit check-ups so you can prevent major repairs in the future. While major repairs should be handled by a qualified HVAC repair service, there are simple maintenance and repairs you can try yourself. Maintain your air conditioning unit in top condition with these easy HVAC repair and troubleshooting techniques. If the central AC does not automatically turn on, either the unit is receiving electrical power or the thermostat is acting up. Before troubleshooting, make sure to set the thermostat to “Cool” and check if the temperature setting is below the temperature of the immediate surroundings. Examine the main and secondary electrical panels. If the fuse is blown, replace it. If the breaker is tripped, just reset it. The central AC should be on a 240-volt circuit. Ensure that the power switch of the condenser and the furnace is on. The 240-volt disconnect must be on, as well. Check the thermostat by testing the compressor. While the AC’s off, remove the cover of the thermostat and then get hold of the Y terminal’s wire by its insulation. Turn the AC power back on before touching its bare end to the R terminal for two minutes. If the compressor goes on, you’ll need to replace your thermostat. Otherwise, you’ll require an HVAC repair technician to fix it. It’s filthy. The unit requires cleaning for the air to flow properly. The AC’s coolant requires recharging. An HVAC repair service is properly equipped to handle such. If your AC unit makes annoying noise, there’s probably a problem with its belt-drive handler. A belt-driven AC blower usually makes noise when the belt that connects the blower and motor slips. This occurs either because the belt is old and requires replacement, or because it’s improperly aligned. On the contrary, if your AC has a direct-drive blower, but it’s making grinding or squealing noise, the problem may be lying in the motor’s bearings. Contact an HVAC repair specialist to remedy the squealing sounds. You can fix the problem if the sound is coming from the ductwork. This is probably caused by a loose metal flap or thermal expansion. Trace where the sound is coming from along the duct, then make a dent in the sheet metal where the popping sound is. This will offer a more rigid surface so the sheet metal will move less likely as it heats and cools. If you are not up to the task of troubleshooting and repairing your central air condition unit, you can always hire an HVAC professional to inspect your AC and keep it working at its maximum.